Previously I wrote about Bōgu-tsuki Karate or “karate with protective equipment.” Afterwards Terry Wingrove sensei provided his eyewitness account from 1968 or 69. According to this account, at that time Gima Shinkin (Shotōkan-ryū) and Konishi Yasuhiro were discussing Bōgu-tsuki karate. It was agreed that Konishi Yasuhiro was the first person who tested protective gear and this was prior to Mabuni Kenwa’s tests. The discussion in fact touched the question of who adapted kendō armour (with padding), who actually had a specific armor made, and what the efficacy of absorbing punching power was. Because of this I’d like to provide a short overview of Konishi Yasuhiro’s outstanding martial arts career. Konishi Yasuhiro (1893–1983) was a Japanese Karate practitioner and Budōka. He founded the Shindō Jinen-ryū and was the first generation vice president of the (old) Zen Nihon Karate-dō Renmei (today’s Renbukai). Born 1893 in Takamatsu City in Kagawa Prefecture. His real name is Ryōsuke 良助. During elementary school he studied Takenouchi-ryū Koshi-no-mawari 竹内流腰廻 from Takeuchi Roku 竹内緑, Musō-ryū Jūjutsu 無双流柔術 from Matui Sanzō 松井三蔵, and Jikishinkage-ryū Kenjutsu 直心影流剣術 from Inoue Masahiro 井上正広. During his junior high school period he studied Jūdō from Okano Kōtarō 岡野好太郎 (10th dan), Takenouchi-ryū 竹内流 from Takenouchi Hyōei 竹内兵衛, and Kendō from Uehara Sōkurō 上原宗九郎 and from Ueda Heitarō 植田平太郎 (1877–1949). After entering Keiō University (Keiō Gijuku Daigaku 慶應義塾大学) in 1913, he joined the university Kendō Club where he studied under Shindai Tadaatsu 真貝忠篤 (1842–1922, Kubota-ha Tamiya-ryū 窪田派田宮流). In addition he entered the Yūshinkan dōjō under Nakayama Hakudō 中山博道 (1872–1958), where he trained Shindō Musō-ryū Kenjutsu 神道無念流剣術. At the Keiō Kendō Club he also met an Okinawan club member and became interested in Karate after seeing the dance that mimicked the form Kūsankū. In July 1922 he received the 5th Dan in Jūdō by Takahashi Kazuyoshi 高橋数良 and in January 1924 (or maybe oherwise in 1927) he opened the Ryōbukan Konishi Dōjō 良武館小西道場, where he began to teach Kendō and Judō and the like. In the same year (1924), he was awarded a Seirensho (see explanation below) in Kendō from the Dai Nippon Butokukai 大日本武徳会. When he met Funakoshi Gichin in June 1925, he was finally able to learn Karate. However, since its contents was only Kata, together with Ōtsuka Hironori 大塚博紀 (1892–1982, founder of Wadō-ryū Karate-dō and Jūjutsu Kenpō) who was also a disciple of Funakoshi, Konishi began to devise Yakusoku Kumite 約束組手 and the like. Later Konishi studied Karate with Motobu Chōki and Mabuni Kenwa. 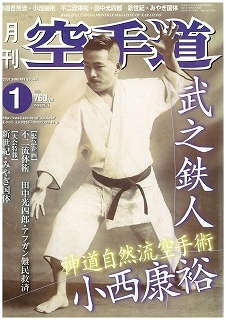 Konishi Yasuhiro on the cover of Gekkan Karate-do magazine. Afterwards he studied Aikidō (at that time Daitō-ryū 大東流) from Ueshiba Morihei 植芝盛平 (1883–1969) as well as Nanban Sattō-ryū Kenpō 南蛮殺到流拳法 from Fujita Seiko 藤田西湖 (1899–1966). In addition he studied many Jūjutsu schools such as Yōshin Koryū Jūjutsu 揚心古流柔術、Shiba Shinyō-ryū Jūjutsu 柴真楊流柔術, Fusen-ryū Jūjutsu 不遷流柔術, Yagyū Shingan-ryū 柳生心眼流. As the culmination of all of the above, in 1933 he established the Shindō Jinen-ryū Karate-jutsu . At the time of the establishment of the (old) Zen Nihon Karate-dō Renmei (today’s Zen Nihon Karate-dō Renmei Renbukan) in 1959 he was appointed vice chairman. The DNBTK was established on April 17, 1895, with Imperial Prince Komatsunomiya Akihito (1846–1903) as is president. From October 26 to 28, 1895, it held its 1st Butokusai Dai-enbukai 武徳祭大演武会. Nine hundred eighty-nine martial artists from all over the country participated. At this convention, particularly talented persons from each martial art were awarded the title called Seirensho. Chosen were 15 persons from Kenjutsu, 17 persons from Kyūjutsu, 6 persons from Jūjutsu, and 3 persons from Sōjutsu. Until 1933 at each year’s Butokusai Dai-enbukai, the examiners would deliberateand issue Seirensho certificates after the end of the convention. In September 1914 the “Seirensho Juyorei” (精錬証授与例) were determined as criteria for selection. It should be noted that it had been determined to be awarded for any number of good fights at the convention, but in fact there was an unwritten law that no person shall be awarded a second time. Until the enactment of the titles Hanshi 範士 and Kyōshi 教士 in 1902, the Seirensho was the highest award issued by the DNBTK. After the enactment of Hanshi and Kyōshi, with Kyōshi being a lower rank, the number of awards also increased, but all were treated the same treatment as if they had received the Seirensho. Many members were of the opinion that Seirensho should become the official title, but in 1934 the Renshi 錬士 title was enacted in place of the Seirensho, and the Seirensho was abolished. It was also proposed to maintain the Seirensho, however, in order to not make the matter too complex it was abolished.